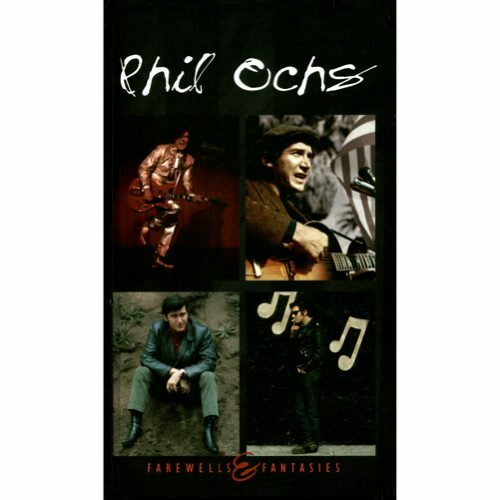 I’ve been a fan of Phil Ochs since I bought this box set when I was 17. It was inexpensive, and with three CDs worth of material, a steal. Farewells & Fantasies is strange. I don’t know if I’d recommend anyone buy this record. The problem is that it’s a lot of music to get through and into, so that leaves out the newbs1 For the fan, it’s far from complete. It selects a best of Ochs, and a mediocre of Ochs. It some times leaves off what I would believe to be essential tracks. So I can’t see a fan wanting to own this collection. The completist is the only one this box is targeted to, as there are about three tracks that are unique to this collection, but those three tracks are far from worth the price of entry. The we can look at who Ochs is. It seems that he gets a lot of flak. It seems that if you’re a serious Bob Dylan fan, you hate Phil Ochs. I’ve heard from many Dylan fans who deride Ochs’ work. I think this comes from a place of ignorance. It seems that Ochs is often compared to Dylan, when the two of them are a world apart. While they’re both folk artists, Dylan was never a folk artist the truest sense of the word. He always had a taste of jazz and blues that true folk doesn’t keep. Ochs on the other hand, even when going electric, or adding an excess of orchestration is a folky at heart. People also deride Ochs for being a singing journalist. He was singing about his world, and the passion he had to make the world a better place. He used sarcasm to sneer at those who are apathetic, and I’m okay with him being a singing journalist in that sense, but the difference is I don’t look at old newspapers, but I do listen to Ochs. Obviously his medium is much more effective. Ochs also matured as a songwriter, and proved himself able to adapt away from his protest songs; while he still protested, he did a bit less directly. My attraction to Ochs and my interest in politics are two worlds that obviously overlap. When I first starting writing about music in 2004, I was writing for Being There. The first feature I wrote was an interview with Joel Plaskett, the second was about Phil Ochs. A decade ago when I wrote about Ochs, I was writing about how the world hasn’t changed in the 30 years since his death. Another decade has passed, and I feel we’re still here. In Canada we have a government that is destroying our electoral laws, and weakening Elections Canada, in Ontario we have a government overwrought with scandal who are still somehow the best option, and in Toronto we have a crack addict mayor who hates women, sexual minorities, and people of colour. Phil Ochs’ voice is still valued. Ochs took Alfred Noyes’ classic poem “The Highway Man” and placed it to a melody that helps the poem shine. The sparse live performance (recorded in Vancouver) makes Ochs’ voice sound far away. The listener feels a distance to the singer allowing the song to chill you. “Pleasures of the Harbor,” “Changes,” “When I’m Gone,” “Here’s To The State Of Mississippi,” “Canons Of Christianity” are all amongst Ochs’ best. “White Boots Marching In A Yellow Land,” “Morning,” and “Santo Domingo” are amongst the songs I listen to the least.